To overcome the golfing yips, professional golf instructor Hank Haney made adjustments in his mechanics and applied mental strategies to help him focus, according to his book, Fix the Yips Forever. Haney suggests that players use mental strategies in practice and during competitive round to help them beat the putting yips. On the course Haney emphasizes the importance of pre-shot routines to help players overcome the yips. “I had to start with a whole new pre-shot routine and mental approach. The mechanical changes that helped my grip, back-swing and through-swing were good steps towards physically hitting shot, but the pre-shot routine is what ‘rebooted’ my mental approach and really got me over the yips,” says Haney. Is Haney saying that changing your mechanics and grip don’t really solve the problem? Sounds like it to me! I am a firm believer in the use of a pre-shot routine to help players stay focused on the present moment and insulate them from distractions. If you don’t have a putting routine, your mind wanders aimlessly as you prepare to hit your putt. This opens the door for doubt and fear about negative results, which exacerbates the yips. One practice strategy he suggests to enhance focus is to putt with the toe of the putter or back of the putter. “This helps player’s focus on making square contact with a much smaller effective hitting area, instead of processing the yip move,” says Haney. I’ve also seen players practice putting with a driver. They don’t have expectations about making putts with the driver and it tends to free them up somewhat. He also suggests putting with balls that vary in weight and size, such as a tennis ball, ping-pong ball, or wiffle ball. This helps players with the yips get different sensation while putting to disrupt the yip memory program they developed and reset their mental approach to putting. I think this is another way to free you from having expectations about making putts. The key to making a good shot or putt is focusing on the present moment; the here and now. I like his idea about using a new pre-putt routine to reboot the system. A pre-putt routine is great for focusing your attention on relevant performance cues. This helps players with the yips eliminate anxiety or fear that comes from thinking about missing a shot. But a routine also have to free you up to trust what you see on the greens. Without this freedom built into your routine, the yips can easily return. 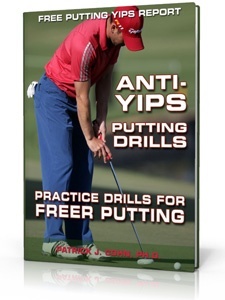 Download my free anti-yips putting drills to help you get started with better putting practice. Do you spend most of your practice time trapped by stroke or mechanics on the practice green? 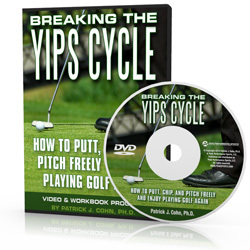 Are you unsure how to practice to hep you overcome the putting yips? 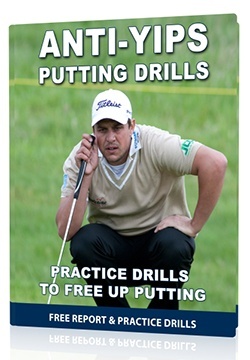 Golfers: Learn how to putt with freedom using proven putting drills! 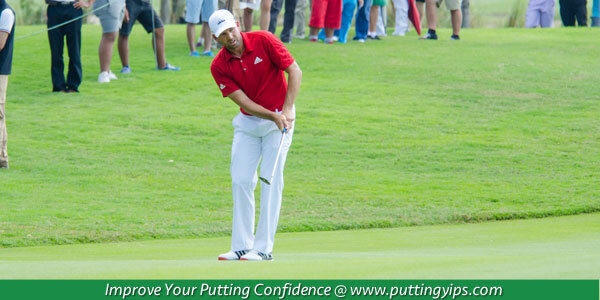 Download our FREE putting report and drills to help you unlock your putting potential today! What are golfers saying about our putting yips drills? Overcome The Yips With Expert Mental Game Coaching!